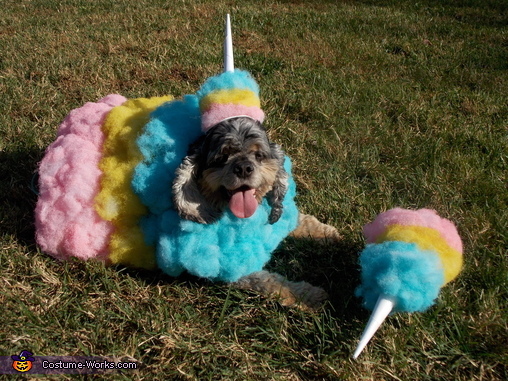 While at the fair over the summer I got the idea to create a cotton candy costume for my dog for Halloween. I had never seen a cotton candy costume before -- not even on a human. Before starting the project I looked online to see if anyone else had ever created one. While I saw a few all pink cotton candy costumes for children, I didn't see any cotton candy costumes for dogs so I knew I had to make one. I took poly-fil that you use to stuff pillows and spray painted it pink, yellow, and blue (I wanted to have several different colors of cotton candy, not just pink). It was tough to get the spray paint on evenly so I spray painted way more pieces of poly-fil than I would need just so I could pick out the ones that looked the best. After allowing the pieces to dry over night, I took one of my dog's old t-shirts and drew lines around it separating it into 3 sections. I then put the t-shirt around a bag of extra stuffing I was using as a form. Then came the fun part -- using spray adhesive to glue the pieces to the t-shirt. When I was all done, the costume was huge and once it had dried and I pulled the form out, the t-shirt retained its shape. I also made a hat out of some of the extra pieces of poly-fil and created a cone handle out of paper. I even made an extra cone of cotton candy that I could carry. Although getting the costume on my dog was challenging because it was so big, once it was one him he actually didn't mind it. I was worried that it might impede his movement because it was so big, but because I'd been very careful not to glue anything to the back of his legs, he was able to move freely. I think my pup looked sweet in this costume -- sweet as cotton candy!